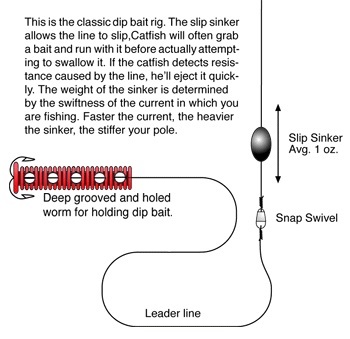 The following rig is the classic dip bait rig. 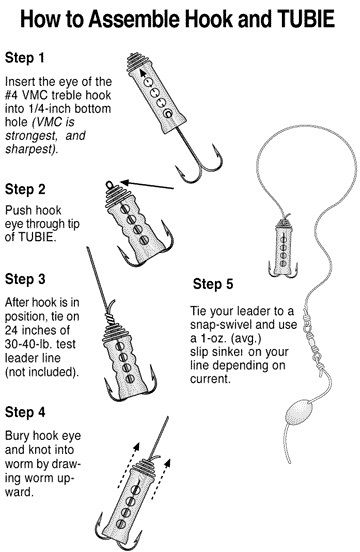 It is for bottom fishing, so it is essential you weight your bait line properly to compensate for the type of current in your fishing spot. The following illustration is the latest innovation from Cat Tracker, the Tubie 2000. Tubie 2000 can be rigged with a treble or single hook configuration. We like the single hook in catch-&-release situations. The single hook will be less injurious to the fish and makes for easy extraction. Tubie 2000 contains another exciting innovation. 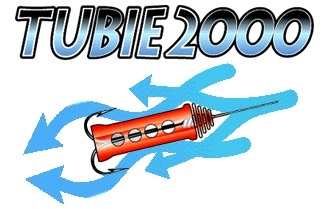 Tubie 2000 is a "flavor bait." 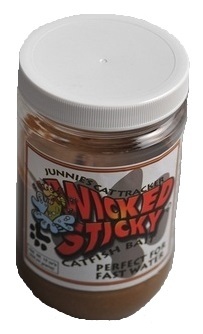 It contains impregnated flavorings of the most popular bait including shrimp, shad and annise. The worms have colors corresponding to their flavors. Shrimp is pink, shad is silver and Annise is black.